Polish and protect your boat or RV in one simple step! 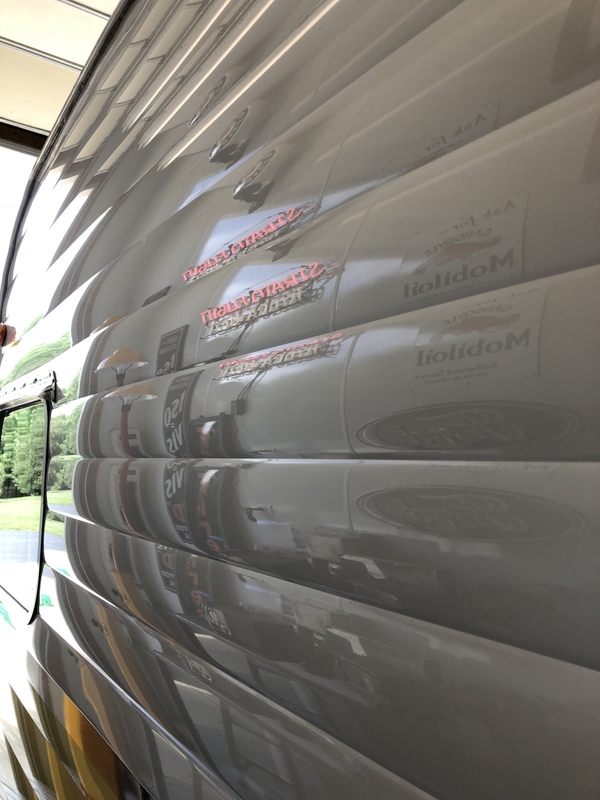 McKee’s 37 Marine & RV One-Step Polish & Sealant is an incredible one-step solution for keeping your boat or RV looking its best. This unique formula eliminates light imperfections and deposits an incredibly glossy layer of synthetic sealant protection in one easy step. McKee’s 37 Marine & RV One-Step Polish & Sealant protects your boat or RV from the damaging effects of UV rays.. Whether your toy of choice is a boat or an RV, there’s no doubt that your sizable investment will spend many hours out in the sunshine be it on the open road or open water. Any well loved boat or RV needs a little bit of maintenance to keep it looking like new. McKee’s 37 Marine & RV One-Step Polish & Sealant makes the maintenance part of your routine easier, so you can spend more time cruising by land or sea! McKee’s 37 Marine & RV One-Step Polish & Sealant is safe for use on gel coat, fiberglass, and painted surfaces, and it can be used in direct sunlight, making it extremely versatile. The gentle abrasives finesses away light oxidation and swirl marks while a coating of synthetic sealant locks out contaminants and keeps your boat or RV glossy for months at a time! 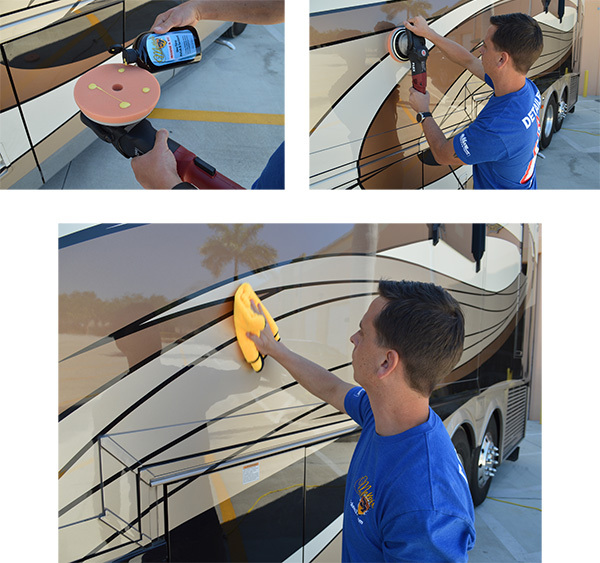 Clean, polish, and seal your boat or RV in just one step with McKee's 37 Marine & RV One-Step Polish & Sealant! 2. Apply a nickel-sized dollop of polish directly onto applicator sponge. 3. Vigorously rub into surface until it turns clear. 4. Buff to a high gloss using a microfiber towel. 2. Apply an X of polish directly onto a foam cutting or polishing pad. 3. Spread polish over a 2’ x 2’ area with the machine turned OFF. If using a rotary polisher, set speed between 800 and 1200 RPM. If using a dual action polisher, set speed between 5000 and 6000 OPM. 4. Using a slow arm movement with medium downward pressure, perform 4-5 section passes, or until the polish turns clear. 5. Remove excess polish using a microfiber towel. McKee's 37 Marine & RV Mildew RemoverMcKee’s 37 Marine & RV Mildew Protectant SprayMcKee’s 37 Marine & RV Water-Resistant Vinyl ProtectantMcKee’s 37 Marine & RV Gloss Enhancing Final PolishMcKee's 37 Marine & RV Hydro Pearl Sio2 CoatingMcKee's 37 Marine & RV Final Step Detail WaxMcKee's 37 Marine & RV All-In-One Fabric & Vinyl CleanerMcKee's 37 Marine & RV Carnauba Wash & WaxMcKee’s 37 Marine & RV Heavy Duty Cleaner WaxMcKee’s 37 Marine & RV Repel Glass & Plastic CleanerMcKee’s 37 Marine & RV All Purpose Surface CleanerMcKee’s 37 Marine & RV Bug Remover & Wax RestorerMcKee’s 37 Marine & RV Vinyl Decal & Graphic RestorerMcKee’s 37 Marine & RV Heavy Cut Oxidation RemoverMcKee’s 37 Marine & RV Carnauba Sealant WaxMcKee’s 37 Marine & RV Repel Glass & Plastic Cleaner 128 oz.McKee's 37 Marine & RV Final Step Detail Wax 128 oz.McKee's 37 Marine & RV Carnauba Wash & Wax 128 oz.McKee's 37 Marine & RV All Purpose Surface CleanerMcKee’s 37 Marine & RV Bug Remover & Wax Restorer 128 oz. 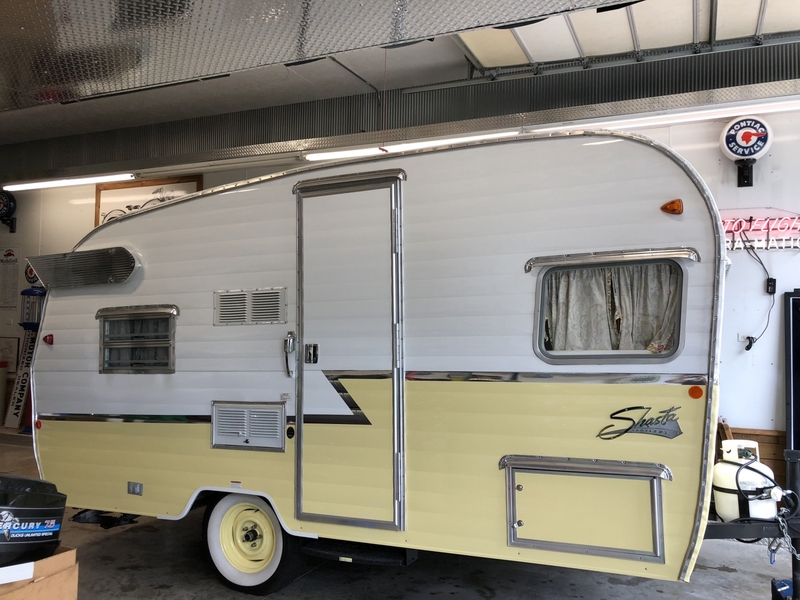 Got this for an Retro remake of the old Camper Trailer job I had (wash & wax). I applied this by hand since it was a new camper and the steal was thin, flexible and corrugated. Easy to protect you RV in one simple step! ProsEverything about it easy to apply easy to take off one step cleaner wax and sealant.